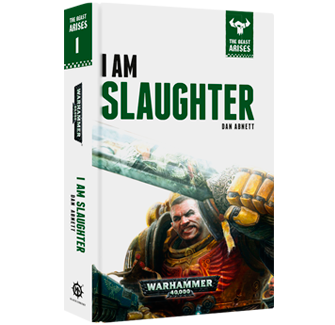 “I Am Slaughter” is the first in a series of 12 planned books set in M32—a post-Heresy period of calm that has lulled the High Lords of Terra into thinking the Imperium has largely conquered the galaxy, driven away the Traitor Legions, and subdued what remaining xenos (including orks) exist on the distant borders of mankind’s realm. Given what we know of the Warhammer 40K universe, it comes as no surprise to learn that the High Lords are out of touch with reality. Although the ork threat was crushed by the Emperor’s victory at Ullanor near the end of the Great Crusade, the green-skinned xenos have had centuries to rebuild their numbers—and to see the rise of a new warlord of frightening power. The book focuses on a small military campaign of the Imperial Fists, who since the Heresy have been stationed on Terra—and who have spent more time on guard duty than active campaigning. Indeed, the “core” of the Imperium is peaceful, and there are political voices actually raising doubts about the cost of supporting Space Marine chapters. The story begins with a cleansing operation by the Imperial Fists, who have been deployed to the “Throne-forsaken world of Ardamantua” to wipe out the Chromes, a primitive species of xenos that are known to plague a number of worlds in the galaxy. But, as the Space Marines’ leaders, accompanied by a magos biologis named Phaeton Laurentis, fight a vicious if one-sided battle of extermination against the xenos, they begin to perceive that a larger threat may be at work. Although unable to communicate with the Chromes, evidence suggests the xenos arrived on Ardamantua as part of a mass migration. The Chromes are running away from something terrifying, like rats scurrying from a burning building. Give the series is called “The Beast Arises” and its ork-green logo includes an ork icon, I don’t think I’m giving too much away by saying this book lays the foundation for what promises to be a horrifying ork threat to the Imperium—and that the High Lords of Terra haven’t a clue of how the you-know-what is going to hit the fan. This is a better-than-average book about Space Marines. The characters are not deeply developed, but they are not caricatures who simply move the plot along. I gave a hoot about their fate. On the other hand, the plot is pretty straightforward. It’s clear this book is simply the preamble to a huge story arc. There are some good battle descriptions, and you may care if the protagonists survive, but it’s clear that the “crisis” of the story won’t be found in this first installment of the series. That said, I thoroughly enjoyed a parallel plot thread involving the High Lords of Terra and other top-level officials back on Terra. Their political machinations, particularly in deploying the Imperial Fists in the first place, was quite interesting. I was particularly intrigued by the character of Drakan Vangorich, grand master of the Officio Assassinorum, who comes across as a “hero” with a sense of great responsibility for the Imperium. That doesn’t mean he’s a nice guy—simply true to the more “noble” principles of the Imperium (think of a devout priest during the Spanish Inquisition). I’ll close by saying I enjoyed the book. It’s not great, but given my love of the 40K universe, a Black Library book that does a journeyman job adds to the “setting” of my wargaming—and that’s good enough for me. The Corvus Cluster is a hobby blog that focuses on the wargaming adventures of the Wednesday Night Gamers of Alexandria in the Warhammer 40K universe.